Dark chocolate cupcakes filled with peanut butter and topped with chocolate ganache. Preheat oven to 350 degrees F. Line 12 standard size muffin cups with paper liners. Place chocolate and cocoa in a mixing bowl and pour the hot coffee over. Whisk until smooth then cool. In another bowl, mix the flour, sugar, salt and baking soda together, set aside. Whisk oil, eggs, vinegar and vanilla into the cooled chocolate mixture until smooth, then stir in the flour mixture. Divide batter between the baking cups. Bake 17-19 minutes, until cupcakes are set and just firm to the touch. Cool completely on a rack. Next, make the ganache. It needs time to cool, so I like to make it early on. Heat the cream in a microwave-safe measuring cup (I use a 2 cup Pyrex) just until it begins to boil. Add the finely chopped chocolate and stir. Let sit for a few minutes, then stir again until chocolate is completely melted and mixture is smooth. Stir in the softened butter. Let cool for about 10 minutes, then pour into a pastry bag or a heavy duty freeze bag and let cool and thicken. Make the peanut butter filling, combine the butter and peanut butter and beat until creamy. Add the confectioner’s sugar gradually, beating until well mixed, then add the salt, vanilla and cream and beat until smooth. Carve a small well in each cupcake and fill with peanut butter filling. You can spoon it in or pipe it out of a snipped freezer bag. At this point the ganache should be cool and slightly thick. If it's not, throw it in the refrigerator for about 10 minutes. Snip the tip off the decorating bag (or Freezer bag) and pipe the ganache over the cupcake. Pipe or spoon a little dab of peanut butter in the center. 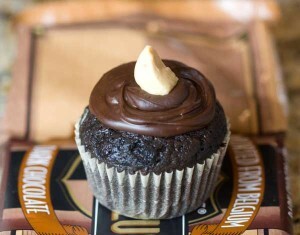 The base of this cupcake is adapted from the Cook's Illustrated Ultimate Chocolate Cupcake. You can substitute all-purpose flour for the bread flour, but the cupcake will be crumblier. The extra protein in the bread flour is supposed to help keep the cupcake from falling apart since it has so much extra chocolate.